← If any of these cartoons makes you angry, you probably have a smartphone addiction. The story surrounding the 70th Biblical Shemitah Jubilee is the single most important mundane and religious narrative of the modern era. Nothing else even comes close. Because it concerns matters of both great worldly impact and profound spiritual consequence, it stands as a uniquely powerful testament to the hidden forces at work throughout the planet today. The clandestine agenda of those forces has finally been outed by THE HARBINGER. Full credit goes to the man of the cloth who first brought this extraordinary material to light. For it is only through the work of Rabbi Jonathan Cahn that the world community of nations has been made aware about the phenomenon known as the SHEMITAH. Jonathan Cahn is a messianic Jewish rabbi who walks his talk, and talks his walk. It’s quite apparent that he lives and preaches his brand of Messianic Judaism with sincerity and enthusiasm. The preceding video presents a public ‘sermon’ which Rabbi Cahn recently gave at a Washington D.C. landmark prior the Supreme Court rulings of June, 2015. Just as he wrote in his book THE HARBINGER, his message of the coming of God’s judgment is both prophetic and unambiguous. It’s well worth watching the entire 9 minute video in order to understand the primary source of much of the information regarding the Biblical Shemitah Jubilee. Rabbi Cahn wrote a sequel to THE HARBINGER titled The Mystery of the Shemitah. This book could be considered the indispensable handbook for all things related the historical phenomenon of the SHEMITAH as well as the Biblical Shemitah Jubilee. If ever there was a need — a DIRE need — for the American people to sit and read one book this summer, this one is it. Together with THE HARBINGER, they introduce highly important information about the weightiest issues of our times. The Shemitah is the name for every 7th year of the Hebrew calendar. It is the year that was traditionally observed as the regular annual period of debt forgiveness in the Hebrew communities of olden days. Not only were debts canceled, the farms fields lay fallow for the same year while the community took special time to renew and rejuvenate both physically and spiritually. First and foremost, however, it is the nullification of debts that distinguishes the Shemitah year. The current Shemitah year began on September 25 of 2014 and will end on September 13th of this year. Because it is the 7th Shemitah in the current cycle (7 x 7 Shemitahs = 49 years) it will be followed by the celebration of the Shemitah Jubilee. The upcoming Shemitah Jubilee is the 70th Jubilee since they first began, and therefore has the distinction of being a Super Shemitah. The coming celebration of the Biblical Shemitah Jubilee represents an extremely significant period when the energies of both the Shemitah and the Jubilee mutually intensify each other. Going back over the past 15 years since the beginning of the new millennium, the previous Shemitah years have ended in September with exceedingly earth-shaking events. 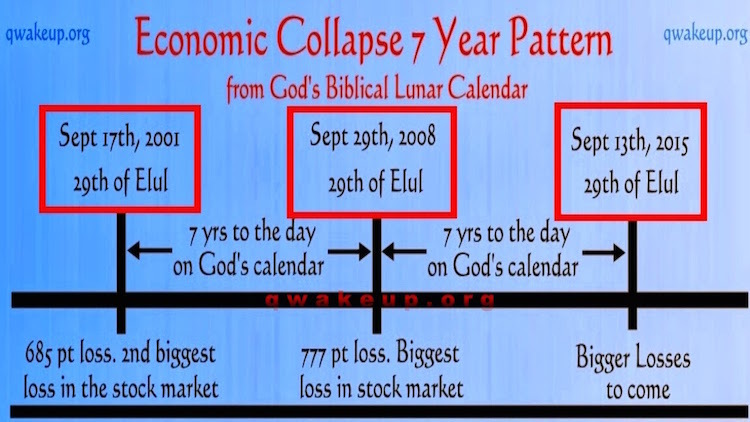 For example the stock market crash of September and October of 2008, which marked the beginning of the Great Recession, occurred at the end of the last Shemitah year. This was preceded by the U.S. real estate market collapse that began in earnest with the beginning of the Shemitah on September 13, 2007. Likewise, the false flag terror attacks of 9/11 and subsequent stock market crash on September 17th both occurred at the end of the Shemitah year of 2001. On September 10 of the same year the Department of Defense admitted to $2.3 trillion missing. DOD Secretary Donald Rumsfeld stated that “According to some estimates, we cannot track $2.3 trillion in transactions.” The Dot-com bubble collapse also took place at the start of that Shemitah year which began on September 30th of 2000. 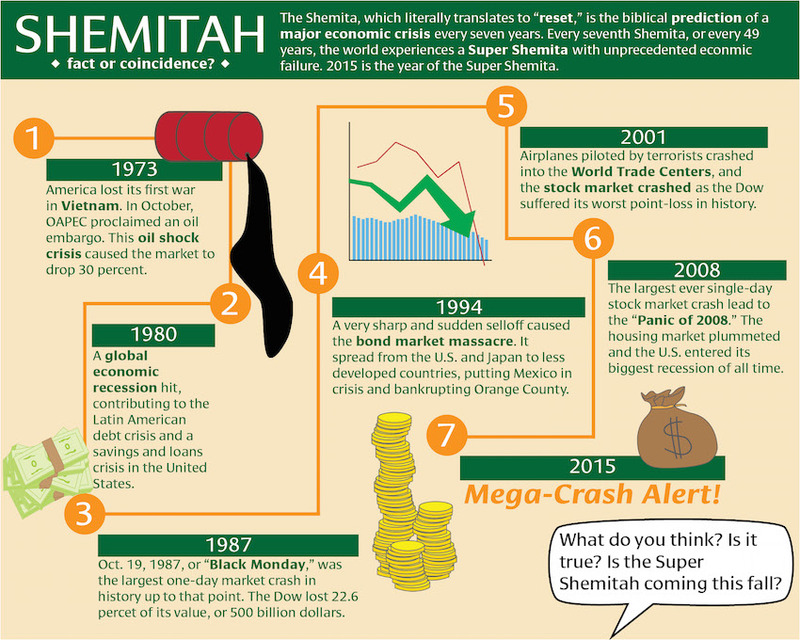 There are many other striking and unmistakable correlations between the Shemitah year and major events within the Global Economic & Financial System (GE&FS) over many decades of the last century. The following diagram depicts the correlation between previous Shemitah September days that fell on Elul 29 of the Hebrew calendar and historic events which literally determined the course of the civilization. Elul 29 marks the last day of every Shemitah year. The key point here is that the very last day of the Shemitah seems to be the most momentous and climactic. Whatever trends and trajectories have been established over the course of the Shemitah always seem to manifest most powerfully on Elul 29, the end date of each and every Shemitah year. That particular day falls on Sunday, September 13th in 2015. Consequently, Monday, September 14th is shaping up to be a very BIG day indeed. What’s the best way to prepare for the Super Shemitah? First, it is essential to understand that this month of September will likely see a series of cataclysmic events that will forever change the Global Economic & Financial System. Therefore, this particular period of time would not be a good time to start a major project, or travel, or conduct big transactions, or build a house, or start a business, or buy stocks and bonds, etc. On the flip side these remaining two months would be an excellent time to consolidate, cut back, economize, clean out, downsize, slim down and prepare. All affairs ought to be finalized by September so that a reactionary mode can be avoided. By being proactive now, and therefore better prepared, one is able to more effectively respond to whatever the Universe throws at them in September. Inasmuch as the current Shemitah began 10 months ago on September 25 of 2014, the last couple of months before the start of the upcoming Jubilee will be extremely unstable and dynamic. Therefore, just like 9/11 occurred 6 days before Elul 29, something quite HUGE could take place just before September 13th on Elul 29. It is actually quite likely that there will be a quickening of events throughout all of August and especially during the first half of September. From September 1 onward, anything goes, anytime. It’s especially important to understand that everything wraps around Elul 29, Sunday, September 13, 2015. If ever there was a date that has been “blasted by trumpets” throughout the entire Earth realm — prior to the actual day itself — September 13th is the one. Never in modern history has a very public warning gone out — IN ADVANCE — of a real doomsday. The date of September 13, 2015 is now on everyone’s radar thanks to the now ubiquitous worldwide internet. There are two eclipses in September of 2015: a solar eclipse occurs on Elul 29 and a full lunar eclipse takes place on September 28. The latter of these promises to have great effect, since it is the final blood moon of a tetrad which has been occurring over the past two years. For those who understand astrology, eclipses are by their very nature inauspicious events, so when they transpire simultaneously with other known periods of difficulty, a mutual reinforcement often occurs. As the NASA map above indicates, the lunar eclipse takes place right over the Anglo-American sphere of influence, particularly the financial and political capitals of New York City and Washington D.C., London and Paris, Brussels and Berlin, Rome and Madrid. All the American states east of the Mississippi along with much of western Europe are located right under the total lunar eclipse. The solar eclipse on September 13 not only occurs on Elul 29, it will be happening while Saturn is charging through Scorpio where it will remain until September 17 of 2015. For those who understand the long-term transits, Pluto has also been cruising through Capricorn which last occurred during the American Revolutionary War. Hence, mid-September promises to deliver some very interesting and eventful weekends. Additionally the Hindu tradition of Pitru Paksha also officially begins on Monday, September 28th in India. It includes a 15 day period marked by the same “admonitions regarding the treatment of eclipse energy”, which is quite similar to what has been prescribed for the Shemitah year. It is considered especially inauspicious to start any projects during the Pitru Paksha period that ends on October 12. Whatever one wishes to make of these heavenly events, astrological transits and religious periods, the salient point is that they are all stacking up this September. There is actually much more conspiring under the radar which ought to give every American good reason to consider what the U.S. Federal Government is prepping for. The following article is a must read for those who care to follow this thread to their logical conclusions. This article is being published on July 13th, a full two months before Elul 29 on September 13th the day before the Super Shemitah Jubilee begins. The current race of humanity, then, has 60 days to do whatever is possible to avert those consequences which have karmically accrued over the past 7 years, 49 years and 3,430 years. That karma, incidentally, has accumulated for each individual, for each family, for each nation, and for each religious group. Given the cumulative buildup and overlap of karmas during these cycles within cycles, it is easier to see how this particular Super Shemitah Jubilee will have dramatic effects on the whole civilization. Because most inhabitants of planet Earth will be completely unaware of its outworking, there are relatively few to share and process this vital information with. Even among those very few who are aware, there is little depth of understanding about the true meaning and likely outcomes of a Super Shemitah. Nevertheless, anyone reading this post, or any of the links contained herein, will have some basic familiarity with the most critical elements. Hence, it would seem incumbent upon those who have been the fortunate recipients of this foreknowledge to inform the many who are unaware. Those who have been initiated can spread the word far and wide. They can also set an example by taking every initiative to safeguard their assets by moving their money into safe havens and protecting their wealth however they must. One immediate initiative stands out for anyone who has a pension plan or 401k account, IRA or KEOGH, or other retirement plan that is invested in speculative investments. Any funds that are exposed to the vagaries of the highly unpredictable and volatile marketplace ought to be shifted immediately. For example, all funds can be moved to investments that are as risk-free as possible. Further, only banks and brokerage houses which have conservative risk profiles and investment policies should be utilized. All of the various markets — equity and bond, currency and commodity, real estate and insurance, derivative and carbon — have their own inherent risks, as well as entanglements with other markets and asset classes. The more speculative should be strictly avoided in order to preserve wealth from this point forward. When appropriate or necessary, credit unions may be far superior to commercial or savings banks. Savings banks are usually safer than most investment houses and commercial banks. The ever-intensifying exposure to all categories of risk now stands at an unprecedented and dangerous level. Therefore, it has never been so important to correctly assess portfolio risks in order to reduce the exposure of all concerned assets. The Shemitah year almost always sees a precipitous devaluation of asset values which have been artificially bid up to create a price bubble. Once the bubble pops, there is no recouping the appreciation or lost principal. 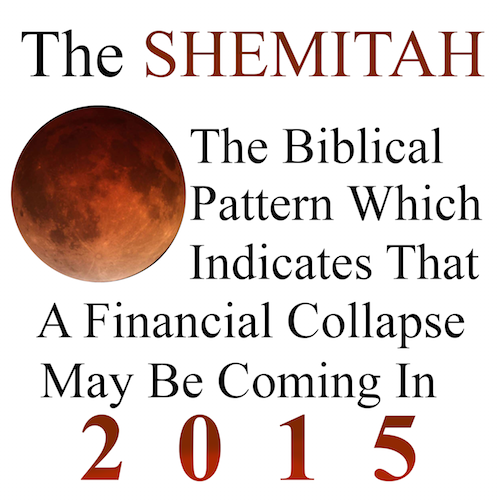 The name of the coming Shemitah game is ASSET DEFLATION. Going forward to September, some asset classes ought to be religiously avoided; that is, if one’s estate is to make it through the Super Shemitah intact. Therefore, the reader may want to move all assets into the safest and most secure investment vehicles available. The Global Economic & Financial System is about to experience a major correction, if not an outright collapse, so wealth preservation ought to be the primary investment goal henceforth. The countdown to September’s D-day is roughly 60 days. Given the Greek debt and monetary crisis, as well as its inevitable repercussions throughout the European Union, the Eurozone is quite vulnerable. The Chinese stock markets have also had a rough ride over the past month undermining much-needed confidence in the Asian economic powerhouse. India has its own systemic problems with their economy, and Japan has never really recovered from its last recession. Clearly the markets no longer inspire confidence. That right there is a very dangerous sign. After all, the stock market is really just a HUGE confidence game. It has always been a confidence game which relies heavily on the con piece. Since arriving at the true valuation of corporations, both large and small, is now an exercise in futility, there is no longer high integrity financial data or fiscal benchmarks or technical info upon which to base sound investment decisions. Hence, Corporate America routinely escapes the scrutiny necessary to keep it in check. 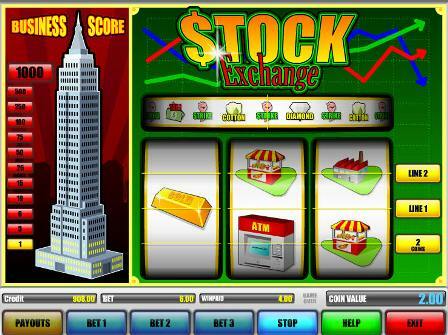 Consequently, the new normal of playing the market is similar to a betting parlor. Truly, all the world’s stock markets and derivative exchanges have become glorified gambling casinos … where the house always wins. The markets have been artificially inflated over many years now in order to draw in as many gamblers (aka suckers) as possible. When the markets have been propped up as high and for as long as possible, they will then be dramatically deflated. We are now witnessing the biggest Sucker’s Rally of all time. Welcome to the Super Shemitah! Two months remain for the world community of nations to address the root causes of the now constant market volatility as well as the profound loss of trust in the Global Economic & Financial System. Will they come together before it’s too late? Once it begins in earnest, there is no stopping the Super Shemitah. The rest of 2015 and all of 2016 will likely prove to be the most earth-shattering and transformative that the world has ever seen. There have been thousands of predictions over the past 100 years concerning the future of humanity and the fate of planet Earth. Whenever a specific day or time was asserted for the fulfillment of any particular prophecy, it failed to manifest. Wherever a specific location was stated to be the site of an apocalyptic event, nothing occurred there. In fact, none of the myriad predictions and prophecies — uttered or written — has transpired as they were stated by their source. While some may have vaguely come true at a different time or place, each has proven that accurate prophecy falls squarely in the domain of the Divine. In light of the aforementioned reality, this 3 part essay is offered with some critical conditions and qualifications. Because the central thesis of this paper — the Super Shemitah — leaves nothing untouched, this is the single most important piece ever written or posted by The Millennium Report. Accordingly, both the writing and research has been undertaken with great care and attention to detail. The TMR has always stayed out of the business of prognostication quite purposefully. However, the sheer immensity of the Super Shemitah demands a decisive and expeditious response. September of 2015 promises to bring the world events of such great import and far-reaching ramifications that the Super Shemitah must be known in advance by as many ‘stakeholders’ as possible. In short, everything that has come before is merely a preparation for what is about to occur “throughout the entire planetary civilization” this coming September. Perhaps for the very first time during this 3rd Millennium, humankind has been given an unparalleled opportunity. It has taken the form of a direct prophetic warning from a real live modern-day prophet. When a genuine opportunity appears as a stark forewarning, the recipient ignores that admonition at their peril. So unprecedented is this rare two month window of opportunity that it should not … can not … must not be ignored or squandered. When the people of the world have been gifted with such privileged knowledge about a highly consequential series of transformative global happenings, it is obligated to pause … … … and contemplate their awesome significance. That they will quite likely take the form of various earth-shaking events and earth-shattering eventualities makes a strong case for paying very close attention. The meaning behind the Biblical Shemitah Jubilee is so profound and compelling, urgent and sweeping that the fate and fortune of billions of people hangs in the balance. Hence, this essay was written to convey the true gravity of events which are soon to commence. The explicit intention here is to sufficiently apprise and warn those who can exert the necessary influence which can mitigate the worldwide effects that unerringly occur during the year of the Super Shemitah.